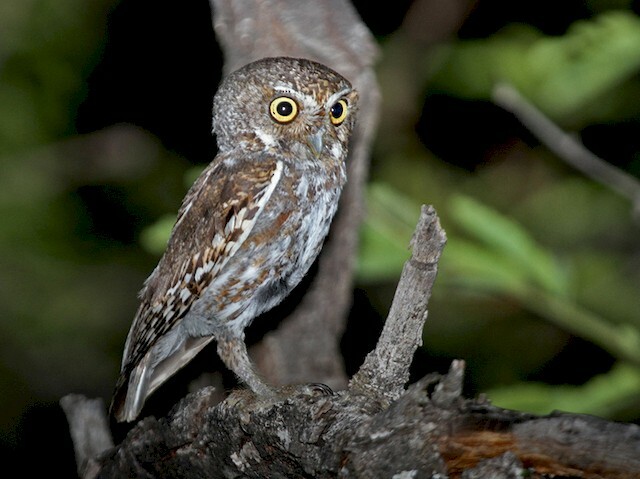 The Elf Owl is the world’s lightest and smallest owl and is found in parts of North America. These nocturnal birds are often heard hooting out to their mates in the middle of the night from the treetops, or from the forested areas. Their current estimated population is about 150,000 in the wild. Size: 12.5 to 14.5 cm (4.9 to 5.7 in) in length with a wingspan of approximately 27 cm (10.5 in) and the tail being 4.6 to 5.3 cm (1.8 to 2.1 in). Weight: The mean body weight is around 40 g (1.4 oz). Feathers: The entire body is covered in dense grayish brown feathers, including their rounded head. The edges of the wings have white spots, as also, the inner corner of the eyes and under them. Eyes: Eyes are round with a yellow border. Legs: Legs are relatively long and often appear bow-shaped. Sexual Dimorphism: Both the sexes look alike, with the female being larger than the male. These birds of prey live up to 3 to 6 years in the wild, and up to 10 in captivity. 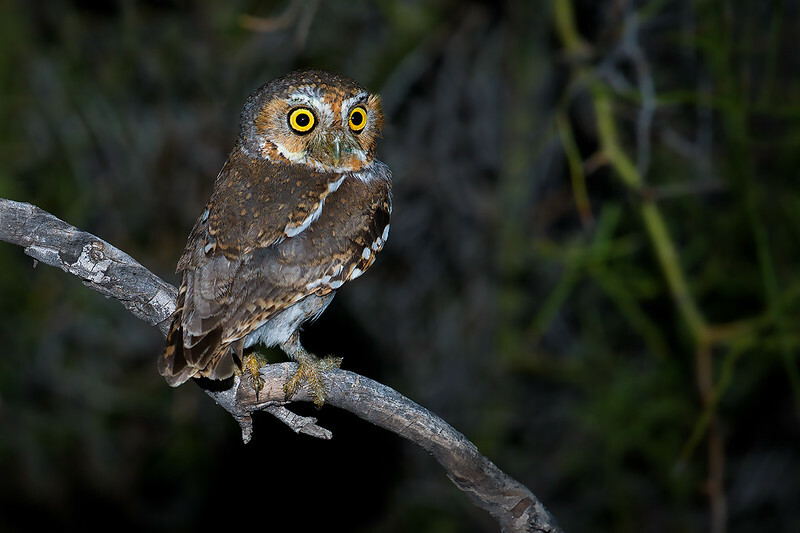 The elf owls are found in the temperate and terrestrial regions of the southwestern United States and Mexico. These owls are spread across a variety of habitats including the desert or dune, forests, dry scrublands, riparian woodlands, open pine-oak forests, mountains, as well as in the urban, suburban and agricultural regions. Like most other owl species, this species is also nocturnal. They are mostly active at around dusk and before dawn. 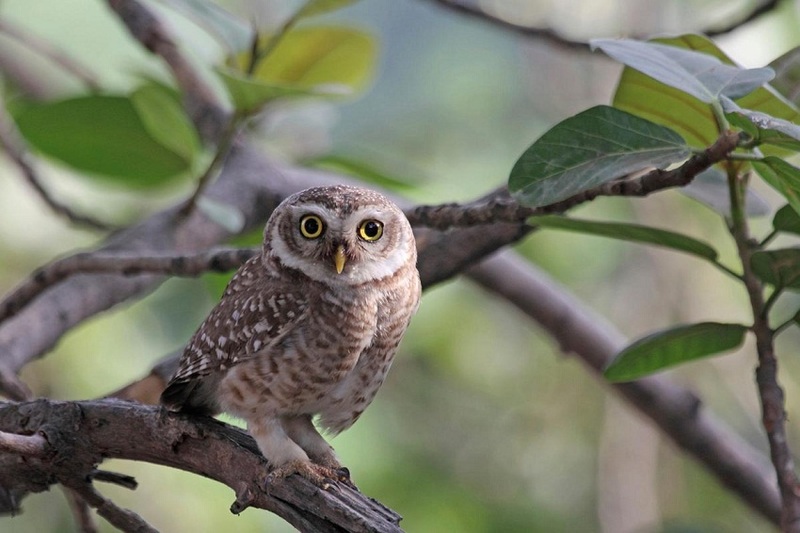 Elf owls have the ability to move by hopping, walking and climbing the branches of trees quite like the parrots. These owls are not aggressive by nature, but both the sexes are territorial. When they set out to hunt, they strike the prey in a straight line. They are also seen flying in U-shaped arcs between the perches, and even hover or glide. Some populations migrate, depending on the subspecies, while the others are sedentary. Elf owls are carnivorous, or more specifically, primarily insectivorous, and mostly consume insects especially those that are nocturnal, including moths, crickets, scorpions, centipedes, and beetles. The mating season of the elf owls is between April and July. They are monogamous, and a couple would remain attached to each other throughout the breeding season. However, by the next breeding season, they might choose a new mate, or may stay with one single mate for life. The male elf owls are polyterritorial, which means, they protect more than one single nest cavity. 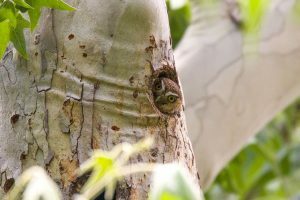 They build their nest in abandoned tree-holes made by woodpeckers, and the alternative nests are meant for roosting as well as for renesting, in case the first nest is not successful. Scientists have studied that the roosting site’s location might be based on behavioral thermoregulation. The female elf owl raises only one brood each year. However, they do attempt replacing lost clutches and might opt for replacing lost broods. A single clutch normally contains three eggs in an average; however, a clutch size may vary between one and five. The clutches of individuals swelling in the desert regions are larger than those living in the other areas. The young chicks hatch out after the eggs are incubated for about three weeks. The baby owls fledge in 28 to 33 days after they hatch out. They are born by the mid of June or early July. By the end of July, the nestlings are almost fledged completely, and ready to leave the nest on their own. However, the parents take care of the young ones until they are able to defend themselves. The dusty brown coloration and white spotted feathers of these owls help them camouflage very easily inside the hollows of tree trunks. 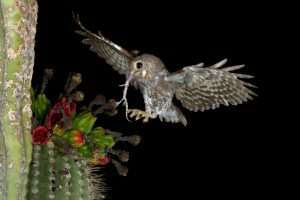 Like other owls, the elf owls too have an excellent sense of hearing and a keen vision in the dark. They can capture their prey in total darkness by pinpointing the targeted animal using their ears. By evolution, these birds have developed the art of ‘silent flight’ with the help of the soft feathers on the edges of their wings. This skill helps them to approach their prey secretively. 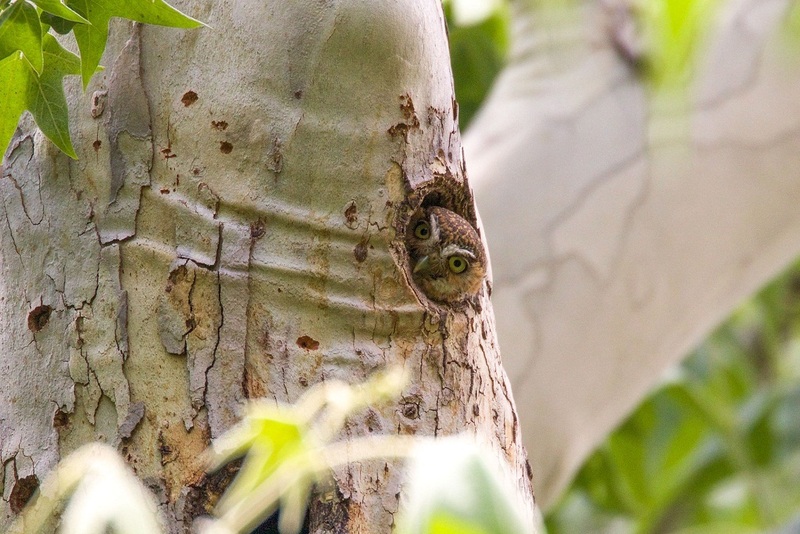 As a behavioral adaptation, these owls build their nests high up in the tree trunks, which make it extremely difficult for the ground-dwelling predators to reach them. Another behavioral adaptation of this nocturnal bird is feigning death if threatened or attacked suddenly. Their primary predators are other owls and birds of prey like jays or hawks, tree-dwelling snakes, bobcats, ringtail cats, and coyotes. The elf owls are abundantly found throughout their habitat and have been enlisted by the IUCN 3.1 as LC (Least Concerned). Hungry juveniles peep or make soft squeaking sounds, twitter calls, and also rasp at a rate of up to 48 times a minute. 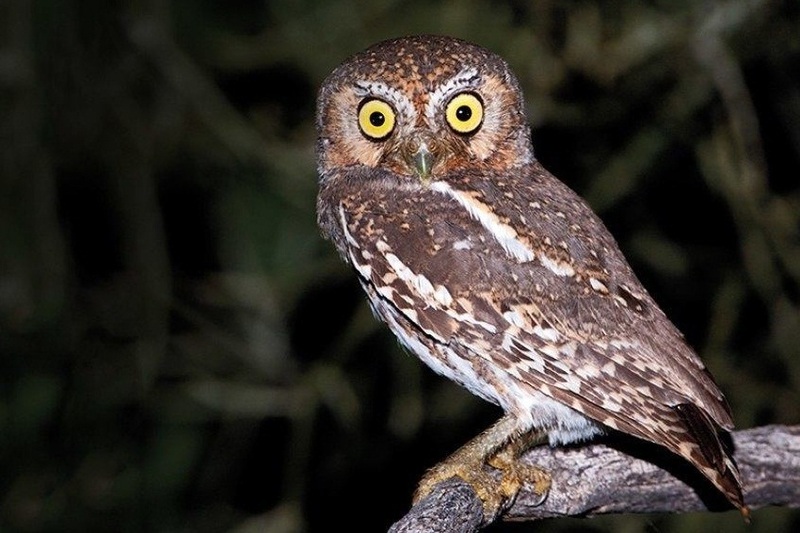 The subspecies Socorro elf owl is thought to have gone extinct in around 1970. 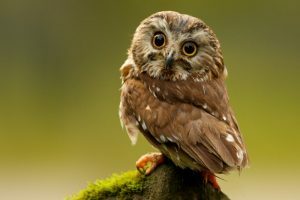 An elf owl named Gylfie plays a major character in a Kathryn Lasky book series Guardians of Ga’Hoole. Its film adaptation was released in 2010. Another elf owl also plays the main role in a techno-thriller by Sam Biondo named The Elf Owl and Imagined Amenities. It has been observed that if this owl kills a scorpion to consume, it will remove the stinger before consumption.